By Ulla Roschat. Just think “At the Mountains of Madness” turned into sound and you have the Tekeli-li album! 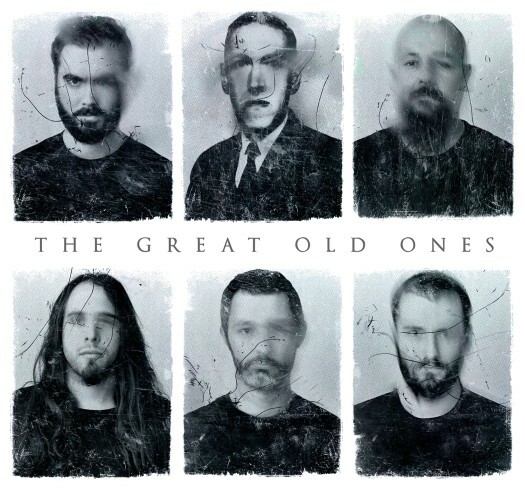 The Great Old Ones, the band name indicates it, chose H. P. Lovecraft’s fiction as a conceptual background for their musical work. They are a five piece band from Bordeaux/France and formed in 2011. Just think “At the Mountains of Madness” turned into sound and you have the Tekeli-li album! The Great Old Ones, the band name indicates it, chose H. P. Lovecraft’s fiction as a conceptual background for their musical work. They are a five piece band from Bordeaux/France and formed in 2011.Tekeli-li is their second album following up their debut Al Azif (2012). The album contains six tracks of which five are genuine songs, the first one is a short introduction with spoken words that leads you directly into a narrative situation and lets you know the following is meant to be a cohesive entity with an underlying concept, namely Lovecraft’s novella “At the Mountains of Madness”, plus it sets a mood of eeriness that won’t leave you throughout the entire album. Stylistically The Great Old Ones blend black and post metal into dense heavy soundscapes to create atmospheres that perfectly fit the icy Antarctic wastes and the spine-tingling horror of encountering ancient alien species with all its implications of fear, confusion and insanity, exhaustion and sorrow. There’s a raw, bleak black metal feel throughout, even in the more ambient moments, with stormy churning uproaring riffs and varying dynamics providing a constant presence of a piercing cold and a constant motion and shifting of atmospheres which is even enhanced by a myriad of subtler less spectacular (but thanks to a quality production effective) changes and contradicting, dissonant melodies and rhythms that add a slight but creepy sense of chaos and insanity. Spoken word parts and acoustic moments are quite rare, but more frequent towards the end of the album in the last and longest track (17:50 min.) "Behind the Mountains" and belong to the the well-conceived structure of the album’s dramatic composition. They add depth and texture and give room for the huge climaxes. 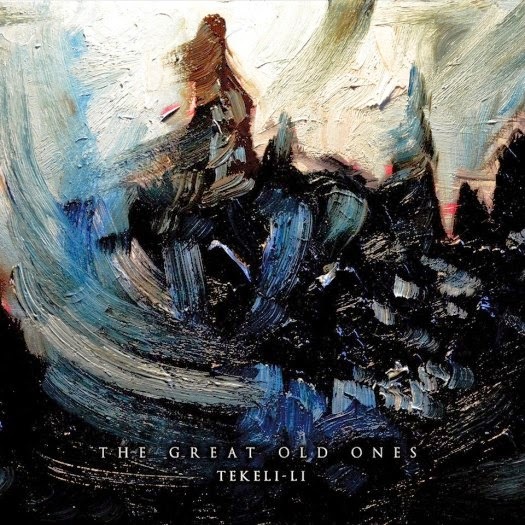 With Tekeli-li The Great Old Ones created a brilliant sonic interpretation of Lovecraft’s “At the Mountains of Madness”. It’s a loving dedication and credit to the author. And so is the album artwork by band member Jeff Grimal (guitar/vocals). He totally catches what makes Tekeli-li unique and distinguishable: the constant swirling motion, the breathtaking flow of exciting events tamed, by a multi-layered and tight structure. This is awesome stuff. Thanks for the post. I'm glad you like it, and yes this is one of the very best album releases for me this year so far. It totally blew me away. And here's more of Jeff Grimal's art, that also got me intrigued. Thanks Ulla, I've added the link to the cover art. One of my favorite (if not my favorite) black metal albums of the year thus far. Only real competition is the new Black Monolith, and that's a whole different sort of band. I've seen Black Monolith mentioned a lot, is their new album on Bandcamp? Yes it is Max! And only $1! The new Black Monolith is another very fine release indeed!